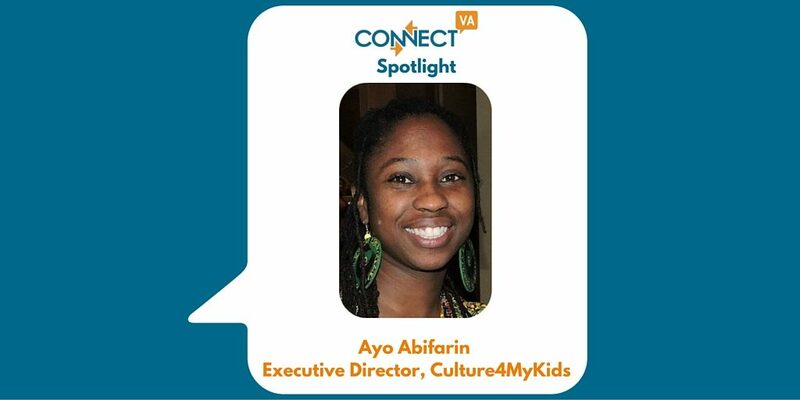 Home / Blog / ConnectVA Spotlight: Ayo Abifarin, Culture4MyKids, Inc.
My name is Ayo Abifarin and I’m the Executive Director of Culture4MyKids, Inc. In my past I’ve been an Educator, Public Speaker, Assistant Writing Center Coordinator, Youth Program Specialist, Youth Production Specialist, Cultural Curriculum Planner, and a Dance Teacher. I have a Masters in Interdisciplinary Studies (History, Non Profit Management, and Education) a B.A. in English (K-12 teacher certified) and a Minor African American Studies. Culture4MyKids, Inc. works with families, schools, and community centers implementing programs that use cultural arts to connect with and make a significant impact on the youth. Servicing approximately 500-1000 youth each year, C4MK is able to give an empowering voice to urban youth. By understanding the past, our students are able to gain appreciation of their diverse origins. These connections allow the students to build/re-build a positive self- image and create a more solid future. Through our school and community center programs, we pride ourselves in building lifelong relationships with the families that we serve. Our overall mission is to empower young people with the ability to take control of their education and their future thus enabling the young people to become successful leaders, community members, and better contributors to our global society. Learn more about our school programs and drumming and dancing programs. Hearing from children who have graduated and who now have children of their own share their lessons and most favorite memories is very rewarding as is walking into a room and hearing and seeing all of these young people call my name and run and hug me. Being a self-sustaining organization with no major funding is a challenge. We really rely on the community around and the parents to pull together to support the organization and keep it going. We are actively working on fundraising and creating a lot of what we need for ourselves. We are really excited about the opportunity to for our Global Leadership Academy members to be preparing to travel abroad this December to Senegal. We rely on Connect VA to keep us up to date with classes that help us build our infrastructure as well as we love being able to share our events on the website. We really stand by our passing the torch model, where we train young people to not only take part in the cultural and performing arts side, but to learn the business as well. We are truly a for-us by-us organization.